And penetrates the sanctuary’s heart. And swell to strangle gallery and tower. And mock the power of overweening kings. Presaging silently the fall of man. IN these and other lines, Helen Ibbitson Jessup captures to near perfection the overwhelming sensation of awe and mystery that Angkor – among the greatest, and the most ambitious, of architectural monuments in the world – produces in the heart of even the most hardened, or casual, visitor. For the site, with its sprawling, seemingly endless, expanse and decay does not sum up the past of Cambodia alone, but, in some ways, of mankind itself. I do not quite remember when I heard that name first: Angkor. To my untrained schoolboy ears, it sounded a little like ankur, that Hindi word which means simply a tiny ‘sprout’, or ‘the shoot of a plant’. But then that frail word seemed to be at odds with the magnificent visions raised by the other fact I was told by my teachers at the same time: that the largest monuments both of Hinduism and Buddhism did not exist in India – the land of the birth of those two faiths – but elsewhere. To be exact, in Angkor in Cambodia, and in Borobudur in Java, respectively. I carry that memory still, and it all came back when I received a book – published in conjunction with a show at Sepia International in New York – of photographs of Angkor taken by the celebrated photographer, Kenro Izu. There it is, in these stunning photographs, the majestic site: miles of ‘gallery and tower’, as Jessup puts it, ancient temples soaring heavenwards and crumbling at the same time, monuments to man’s faith and energy, stone and root and dust. 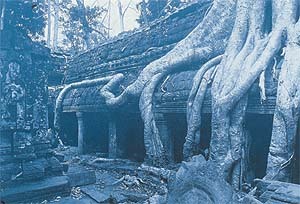 As the capital of the great Khmer kingdom founded in the ninth century, Angkor saw some astonishing building activity. The greatest of Khmer kings – devotees of Vishnu, or Shiva, later even of the Buddha – raised structures that vied with each other and proclaimed their faith. Their builders had visions that came to them distilled from a distance, and from ancient memories: the mythical mount Meru loomed in their minds, a churning like that of the ocean seems to have taken place somewhere inside of them. As they built, naga figures sprang from the bowels of the earth, apsaras danced around them, spirited steeds stood in phalanxes while battle cries rang in the air. In the form of Bakheng, Pre Rup, Bayon, Angkor Wat, Ta Prohm – names that every student of art and of history of these lands knows – great temple-mountains rose. All between the ninth and the thirteenth centuries. And then they disappeared, or nearly. Time, in the form of a dense forest, claimed them. Kenro Izu’s photographs make us a witness to this. Quite remarkably, in all these images, he leaves the human presence completely out. No tourists, no locals vending their wares, not even casual wanderers, intrude upon the eye. 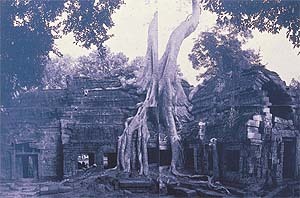 And all that one sees is colossal structures, a very few – like Angkor Wat – dressed up and neatened, but most of them mouldering and sad: piles of rubble lying about, flagstone paths strewn with fragments of broken columns, bodies of sprightly nymphs cleaved by fissures, smiles on the faces of giant Lokeshvara figures now wan and fading. One can almost feel the eerieness. Among the most moving of the images are those from Ta Prahm where giant roots curl around and ensnare gigantic walls, tear floors apart, and snake their way about. It is almost as if man and nature were locked in mortal combat here, structures struggling, Laocoon-like, to free themselves from deadly coils. In some of these photographs there is the overpowering feeling that if one were to put one’s ears to the ground, one might be able to hear the roots breathe and silently swell under the surface of the earth. Beating oars no longer splash. The prince will not come." It is all quite moving.